Wolfram’s Mathematica (now version 8.0.4) is a mature product used by many professionals and academics, and the past couple of years Wolfram has started getting developing mobile applications. I’ve already reviewed their Astronomy and Chemistry course assistant apps, which are excellent and inexpensive products for students. This review is on Wolfram’s Tides Calculator, one of their new Reference apps for the iPhone/Touch and iPad. The tides are relevant to many people around the world that live on or near the coast, or that make a living on the sea. 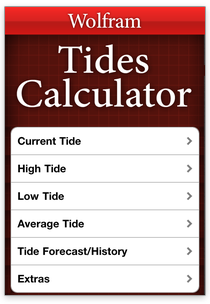 Wolfram provides a low cost ($.99) app that is easy to transport and provides good information about the tides, including Current Tide, High Tide, Low Tide, Average Tide, Tide Forecast/History, and Extras. I downloaded the Tides app from the iTunes store and it was a typically easy install onto my iPod Touch. I selected the first option (Current Tide), and and the default location was set to Current Location (handy of you are on the go and want the tide info for your current site. As tides are not as much of an issue for us in Minneapolis, MN, I entered Maine for the Location and pressed the Compute button. In a couple of seconds, the app displayed a chart for the tides covering 24 hours, with the time and height of high and low tides for Maine. As I entered the search in the afternoon, the returned results covered the current and next days which is better than forcing one to go to a different path to get the tide info for the next day. One thing to note: this data was computed based on historical data and did not include weather-influenced factors like hurricanes, so take this into consideration if you need current information and bad weather impacts your location. There is other useful data on the same screen. The tide reporting station for Maine is at Bangor, at the Penobscot River, and the coordinates of the station are included (good for using with Google Earth), along with the relative position of the station in relation to the state of Maine. Another bit of useful information on the screen is sunrise, sunset, moonrise, and moonset. Not all of the screen information is visible at the same time, but it is easy to move around or zoom out as needed. Next I checked out the High Tide and Low Tide information. I again used Bangor Maine as the location and essentially saw the same information displayed as I saw at the Current Tide screen, although the graphs highlighted the high and low tides respectably. I used Bangor again for the Average Tide option, and there were a few extra bits of information (range of tide, average high tide, average of high and low tides, and average low tide), but had mostly the same information as was shown at the Current Tide screen. The next option I tested was Tide Forecast/History. Using my favorite (Bangor, Maine) location, I retrieved the tides forecast for 11/24/2011 (Thanksgiving Day in the US) and saw a nice 24 hr graph of the expected tides, with times/heights of high/low tides along with sun/moon rise/set times. Good data for a forecast. Next I left the location alone and changed the date to 11/24/2010 and the app downloaded the historical tide data for last year – also, good data. Finally I checked out the Extras options and they were: Sunrise and Sunset, Sun Exposure, UV Forecast, Weather and Forecast, Moon Phase, and Properties of Oceans. For Sunrise and Sunset, I retrieved the information for my current location (Minneapolis, MN) for tomorrow and saw the data, plus the duration of daylight (good to know as we edge closer to the shortest day of the year), the altitude and azimuth for my location, a nice graph of the sun path for tomorrow, some cool (to amateur astronomers) star properties, an image of the current Earth/Moon/Sun configuration (science teachers, paying attention? ), and the 10 closest stars (including Wolf 359, mentioned once or twice in Star Trek: The Next Generation). Excellent information for educators and astronomers. Another Extras option is Sun Exposure, where you can enter your location, date, and skin type to compute the most appropriate sun tan lotion needed to protect your body. Nice. With my skin type, I will need an SPF 15 if I head outdoors tomorrow. I like the UV Forecast option too – it gave the current UV conditions, along with a map of most of the country that showed this data, along with the expected time to get a sunburn (based on skin type and exposure), and the recommended SPF factor for sun tan lotion. The next Extras item I checked out was the weather forecast. I regularly check weather when I fly, and I’m just as interested in the weather when driving in Minnesota in January and February, so this is one of my favorite extras.The forecast for the current day and next day is useful, and the graph for the temperatures for the upcoming week is also good to know (especially as the highs and lows for each day is also included). I also find the precipitation rate and wind speed forecast graphs to be very useful and both enhance this aspect of the app. I should add you can get weather forecasts for other locations than current location, so this could be a nice assistant when planning a vacation. The next option in Extras is Moon Phase, which provides good info if you’re wanting to look at the Moon. The last Extras option is Properties of Oceans and it provides Ocean Information, Ocean Properties, Speed of Sound in the Ocean, and Pressure Under Water data. Good information for planning a dive, don’t you think? The price is excellent, and the UI is simple yet functional. This is a good tool to use to help plan a vacation. The app does what good apps do – it retrieves information over the internet (from Wolfram servers), reducing the footprint of the downloaded/installed app. I like how the locations default to the current location (great for lazy mobile device owners like myself). The amount of information in Extras is excellent and really expands the app. Weather is my absolute favorite option in this app. Didn’t like seeing the same information in Current Tides duplicated in the High, Low, and Average Tide screens. I’d rather have buttons at the Current Tide screen that would provide the additional information. I think it might have been better to release a Weather App, which includes Tide information, that a Tides App with weather information. The information is useful to a lot of people, not just sailors. As a fiction writer, I may need to know past or future tides that affect the characters in some of my stories, and this inexpensive app would be an excellent resource. While I know many people (including me) prefer free apps, it is hard to argue with the low price for this app. Buy it. Skip the burger on the McDonald’s value menu and buy this app. It is interesting information, and good, inexpensive apps need to be purchased to encourage vendors to continue to provide quality apps at a low price. Wolfram currently has another 8 Reference Apps available, and the next one I’ll review is their Fractals App. Please let our readers know if you’ve tried this app and your impression of the software. Sharing experiences on expensive apps is important, but so is telling others about good, low cost applications.